Please join us for the commemoration of the 75th anniversary of Crimean Tatar people deportation from Crimea in 1944. This event aims to bring attention to the current situation of the Crimean Tatars through their tragic history. 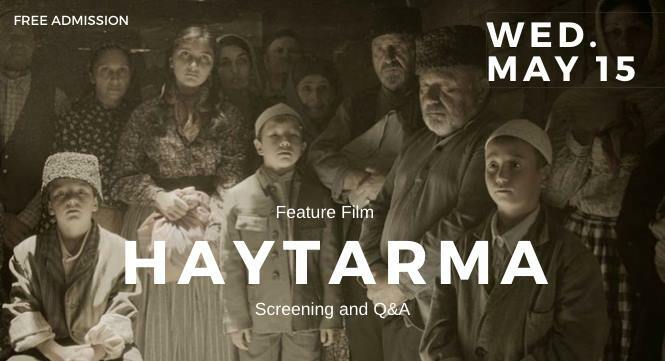 Haytarma is the only feature film about 1944 deportation of Crimean Tatars. Screening will be followed by a question and answer session. The event aims to bring attention to the current situation of the Crimean Tatars through their tragic history. This 2013 Crimean Tatar-language film portrays Crimean Tatar fighter pilot and Hero of the Soviet Union Amet-khan Sultan against the background of the 1944 deportation of the Crimean Tatars. The title of the film means “Return”. The movie is in Crimean Tatar and Russian with English subtitles.